In the blistering heat at Cannich, Fort William progressed through to the RBS MacTavish Plate semi-final with a 7-0 win over Strathglass. Under glorious sunshine, it took less than 15 minutes for Fort to hit the net with a goal from yours truly! Four further strikes more from Arran MacPhee and a further two from myself and Daniel Stewart, rounded up a great afternoon for the An Gearasdan club. However, this is where the new MacTavish Plate competition, for me, starts to lose merit. 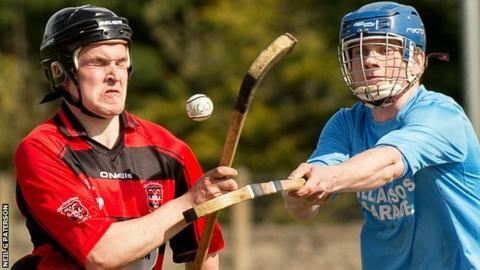 The Camanachd Associations restructure of the leagues this season has resulted in fewer games for senior clubs. Subsequently, the thinking behind the MacTavish Plate, was to progress all teams knocked out in the first round of the North's MacTavish Cup, to its new competition, the MacTavish Plate, so each club played more Shinty. After Skye's 3-2 win over Lochaber on Saturday - apart from ourselves - this has left only North Division 1 and Division 2 teams in the competition. Fort Williams young reserves who clashed with Boleskine last weekend in North Division 2, stormed into a 3-0 lead before sealing a 4-3 victory. Boleskine, because of a bye, are scheduled to meet Fort William first-team in the semi-final of the MacTavish Plate. In my opinion, North and South Division 1, are as low as you should be allowed to go when potentially matching up, Premiership and National Division clubs in cup competitions. I don't think it's healthy for the sport, nor the players, to be playing against such a huge gap. And with the greatest of respects to the Farr club, they may even go on to beat Fort William. However, I think the Camanachd Association may have to re-think how they structure this competition for next year if they want this trophy to gain some merit. Do you agree or disagree that there should be a limit on how far down the leagues you could potentially be matched against, or are you happy with the current structure? In the RBS MacTavish Cup competition, Lovat, Glenurquhart and Newtonmore all progressed to the last four with ease. However, the surprise of the day was Finlay MacRae's 90th minute winner as Kinlochshiel beat Kingussie 3-2 at the Dell. Looking ahead to this weekend, it's the first round of the Artemis MacAulay Cup and Fort William have home advantage over Glenurquhart at An Aird. After Fort William's relegation last season, the An Aird men have only had the chance to play one Premiership club this season: where Kingussie won 2-1 AET in the MacTavish Cup. This will be a great opportunity for the rebuilding squad to gauge where they are against another Premiership club at this early stage in the season. For all the other fixtures, news and reports, visit www.shinty.com.